It’s been a while since my last Stranger post and a lot has been happening in that time. I’ve just recently relocated permanently from Australia to Los Angeles for work and a lot of my time has been been spent on organising this move overseas (which is quite the effort may I say) and getting settled in a new country. Thankfully I have gotten over most of the stress of the move and now have some spare time on my weekends to go out and start shooting again for this series. With that being said, I’d like to introduce the first stranger of 2013 and also the first stranger in Los Angeles since my move, officially #40 in the series – Vladimir. After moving from an Australian summer which was seeing record high temperatures being broken, I was stuck in a Los Angeles winter, which on this day was a very comfortable 28˚C (83˚F) – terribly good weather as always. It was midday and the sun was at its brightest with not a cloud in sight, not ideal for shooting flattering portraits. As I walked home after a stroll along the Santa Monica Beach I had seen Vladimir take a walk past me. My camera was packed away in my bag, so I quickly grabbed out my gear and turned back in the direction he was walking, trying to scout possible places to shoot this portrait before I had reached him. Luckily for me, by the time I had caught up with Vladimir, we had stopped nearby an alley way which would give great protection from the harsh sun and enable me to get some softer light and shadows for the portrait. So after asking for permission to shoot, Vladimir happily took some poses whilst I snapped away. 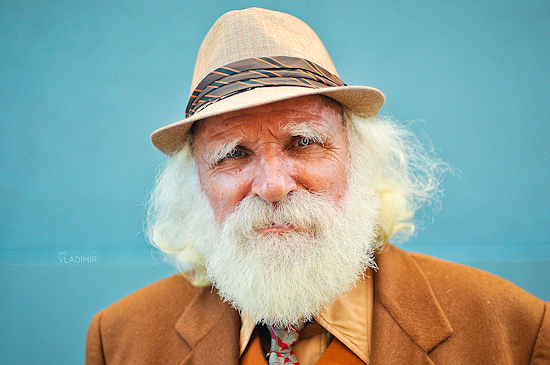 The thing that first captured my attention was his outfit, so I started with a few full-length shots before finishing off with some head shots to capture his magnificent white beard. Vladimir is now retired and enjoying the fantastic weather and lifestyle of southern California every single day. Prior to retiring though, he was a Aircraft tools designer for Northrope Aviation and had worked for many other big name clients such as IBM and Gillette to name a few. He was originally born in Bulgaria, but has been happily living and working in Los Angeles for the last 40 years. Vladimir was very impressed with the photos and asked if he could be sent some printed copies, which of course I happily obliged. He also asked that these photos could help to make him rich and famous so he could live out his retirement by travelling the world, with Spain, Italy and Australia high on his list. He was such a intriguing character that we ended up chatting for another 20 minutes about life in Los Angeles. He said that this moment had “made his day” and he couldn’t wait to see the photos when they arrive in the mail. That’s just the reason I love doing this project so much, sometimes it just puts a smile on someones face and makes their day that little bit more memorable. 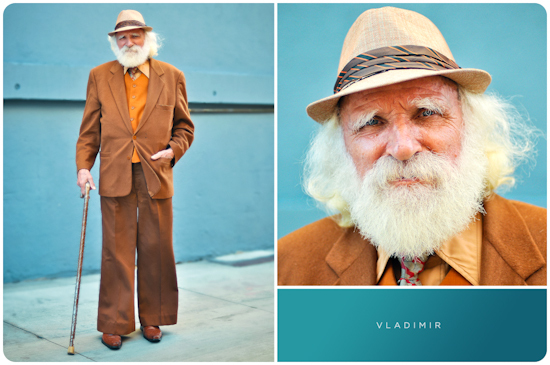 Thank you Vladimir for bringing up the 40% mark in my Strangers series. I hope you enjoy the photos. You’re off to an auspicious start in Los Angeles! Love this portrait. I love this photo!! You’re very talented! !